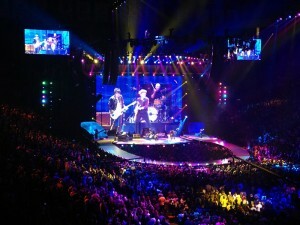 Lighting designer Patrick Woodroffe delivered a stunning lighting design for the Rolling Stones 50th Anniversary tour using a multifarious super rig of Clay Paky fixtures. Assisted by stalwart Stones lighting director and programmer Dave Hill and lighting director Ethan Weber, Woodroffe created a spectacular, multi-layered super-sharp design that worked in perfect synchronicity with the visually dramatic and evocative set, designed by Mark Fisher. 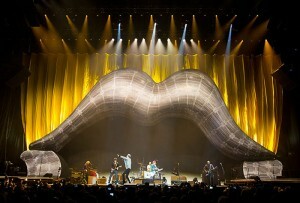 Aptly contemporary, the stage design was a clever take of the famous Stones tongue and lips logo. The strikingly architectural lighting design marked out the contours of the stage set from above and from stage level, giving dimension, shape and context to the set design while pulling the band out from the backdrop with striking effect and at the same time reaching out and embracing the excited audience, ensuring they were immersed throughout. London-based lighting company Neg Earth supplied all the lighting equipment including Clay Paky Sharpys – now firmly established as rock show stalwarts with their pure, laser-like beam – Clay Paky Alpha Spot 1500s, Alpha Profile 1500s and Alpha Wash 1500s fixtures. 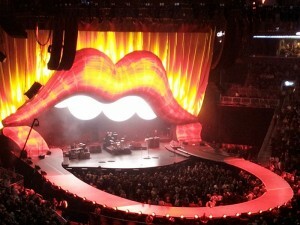 However it was the Sharpys that created that all important laser like outline of Fisher’s suggestive set design. 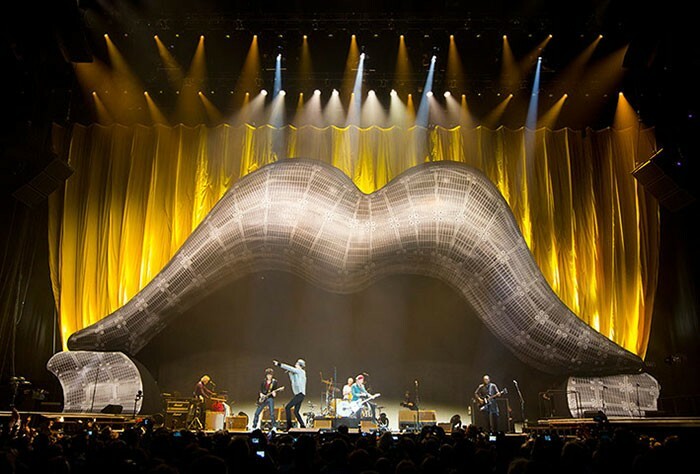 Lighting director Dave Hill discusses: "We used 32 Sharpys on the Horseshoe/Tongue truss and 14 on the Arched Truss behind the lips. 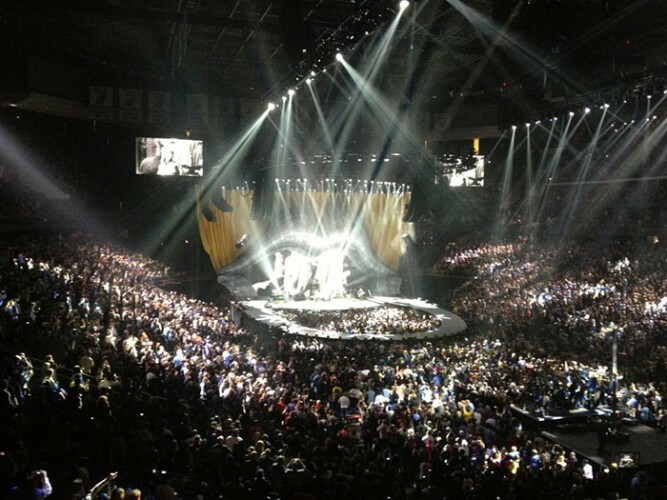 They were used to create an outline of sharp beams," explains Dave Hill. "As always, they were reliable and looked brilliant, really adding dynamics to the show with incredible power. They are compact, light and punchy units with outstanding speed in movement - I love them!" Philip Norfolk, sales director for Clay Paky’s UK distributor Ambersphere continues: "We were delighted to see Patrick Woodroffe and his team specify such a comprehensive rig of Clay Paky fixtures on such a seminal and much looked forward to sell out show. As ever, Patrick created a phenomenally exciting and dynamic design. It's absolutely extraordinary to think that this long time significant rock band is still performing after 50 years, and still with such incredible style. Obviously we were utterly delighted to see such a large contingent of Clay Paky fixtures get put through their paces – what can I say, the show looked absolutely stunning."